NAIROBI (Reuters) - Kenya's deputy president has said there is "no room" for homosexuality in Kenyan society, a widely-shared view in African countries that puts their leaders at odds with Western aid donors who back gay rights. "The Republic of Kenya is a republic that worships God. 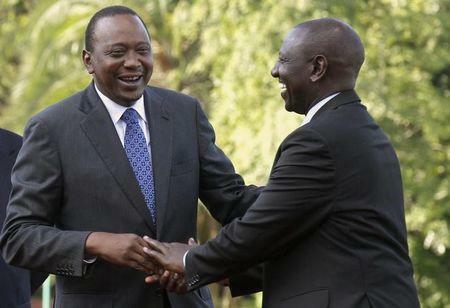 We have no room for gays and those others," Ruto told a Nairobi church congregation in the national Swahili language, according to an online video posted by Kenyan broadcaster KTN. Speaking at a news conference on Monday, Kerry was not familiar with Ruto's remarks but said it was the U.S. position that "all people are created equal." Like most of sub-Saharan Africa, Kenyan society is strongly religious and socially conservative. Anti-gay remarks by African leaders often win public support but puts them at odds with Western donors who provide vital economic and other support. When neighboring Uganda passed a law last year that toughened prison sentences against gays, Kerry described it as "atrocious" and compared it to anti-Semitic laws in Nazi Germany. The law was later struck down by a court. The United States is a valuable donor to Kenya, providing annual aid of almost $1 billion, some of it to help the security forces but much of it to support treatment of HIV/AIDS victims. Homosexuality is illegal in Kenya and has been so since colonial British rule, which ended in 1963. Kenyan activists condemned Ruto's remarks on social media. "Kenya's deputy president joins an important tradition by Africans in power to spread hate in church on a Sunday," Binyavanga Wainana, a prominent Kenyan writer who is openly gay, said on his Twitter account. Last week, Kenya's High Court ruled a prominent gay rights group could register as a non-governmental organization after a board overseeing such applications refused its request. The attorney general has appealed. Ruto, who took office in 2013, is being tried on charges of crimes against humanity at the International Criminal Court for his alleged role in stoking ethnic violence after Kenya's 2007 presidential election. He denies the accusations. President Uhuru Kenyatta had faced similar charges, but they were withdrawn last year.